Making your plants feel at home. Either I have become a terrible blogger, or I am simply right to state that the electronic scene these days has been a bore to say the least (note that it is probably the former). Now, that is not to say that this fall season has yielded nothing fruitful worthy of a mention, however there has not been an EDM album that really grasped me in a while. This, my friends, is the reason why I have converted to radio rap for the past month, to the great displeasure of my roommate who no longer enjoys my overwhelming audio presence. No lie, Drake has been my main man for quite some time now. 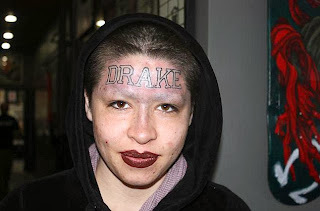 There is nothing wrong with a little OVO in your life, although I would completely avoid forehead tattoos as a means to represent your transient love for an old Degrassi cast member. Nevertheless, let me inform you all on a few of the notable releases over the past month. Nicolas Jaar and David Herrington are doing well for themselves, having released yet another EP under their collective alias 'Darkside'. Entitled "Psychic", and quite a logical extension of their previous collaboration (self-entitled EP), this collaborative effort is riddled with subliminal baselines and static stutter, creating a rather foreign atmosphere, as though belonging to the soundtrack of a movie along the lines of Prometheus. Legowelt has been keeping busy over the past years, and is rapidly becoming a large player in the Holland dance music scene. Taking inspiration from deep detroit house and chicago lo-fi, it is no surprise to hear his sound evolve as a function of the fusion of the aforementioned musical sub-genres. His newest release comes to us through L.I.E.S. records, entitled "Teenage Romance". A 3 track EP, the song displayed below sees subtle variations throughout its duration that maintain the interest of the listener through the relative monotony of it all. Furthermore, this piece harbours additional patience regarding the development of drum kit complexity, causing an atmospheric progression that really creeps up on you. Charles Murdoch has been an artist that I have vaguely followed over the course of the year. The reasoning behind my utilization of the word 'vaguely' is related to my varying musical phases, and my subsequent interest in what I believe to be considered 'mass appeal house'. Nevertheless, although I might have been sleeping on his releases, the Australian producer has definitely been making noise through labels such as FutureClassic. Having divulging an EP 2 short months ago (Weathered Straight), Mr. Murdoch is back at it with a remix of Bodhi's "No More". The chord progression is properly curated and everything seems to work towards what can be considered as a 'cookie-cutter' house song with slight alterations. However, this does not make it unpleasant to the ear, simply generic and highly comparable. The Melt is a record label based out of Los Angeles that hosts an array of 2-step, chillstep, footwork, garage, and house artists. More importantly, one of their forthcomings, "From the Ghetto" comes from a musician by the name of Snorlax. For the most part, if you aren't into juke/footwork, then the original pieces are not for you; the remixes, contrarily, are wonderfully composed (from the small sample available on Soundcloud). More precisely, the introduction of Colta's remix gives way to my curiosity pertaining to the continuation of that piece, and will most probably be the most well received of the 4 tracks comprising this EP. Unfortunately, The Melt has not released any stream for this (to my knowledge), and as such I will be demonstrating a different release from the label as an amuse-bouche of some sort, along the lines of chill step. Through much introspection, I have determined that I would very much enjoy the presence of plants in my room. In other words, I wish to create a living, breathing ecosystem along the lines of a jungle. Now, I am well aware that they take much care and are an added responsibility. However, I was completely oblivious to their musical tastes. Thankfully, the folks from Estonia are capable of providing music for your plants. Saturated with samples derived from the depths of the Amazon, coupled with tribal chants, your plants will feel right at home, providing them with optimal conditions in order for them to thrive. Give them the treatment they deserve below. This entry was posted on Monday, November 11, 2013. You can follow any responses to this entry through the RSS 2.0. You can leave a response.